Many runners strive to earn the coveted Boston Qualifying Time (BQ). This has become increasingly difficult each year, as the time to earn an entry into Boston has actually gone down several minutes from the original posted BQ to accommodate high participant numbers. 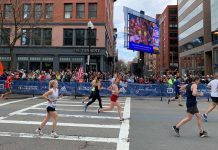 The Boston Athletic Association has recently remedied this by officially lowering the times by five minutes for each age group for entry into the 2020 Boston Marathon. 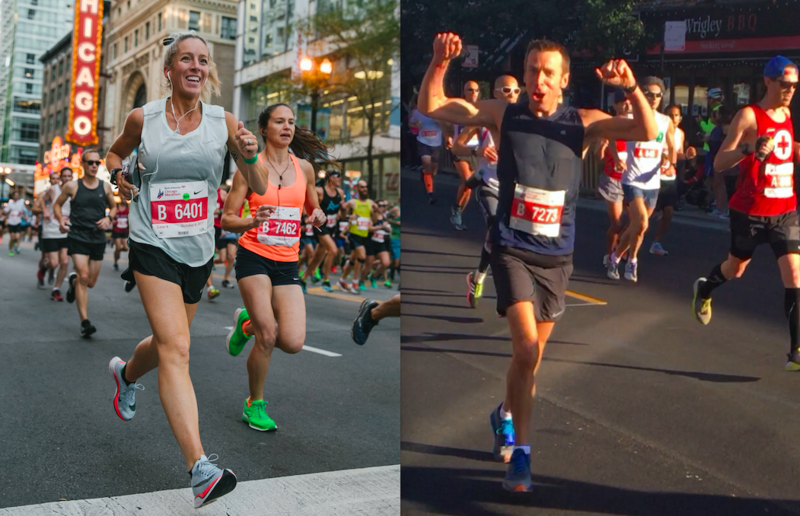 Jeff Jameson and Mandi Florip are two Chicago Athlete Ambassadors who will be running in the 2019 Boston Marathon on April 15, 2019. 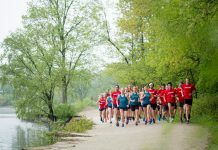 They will be writing a series of stories about their experiences with earning qualification, registering, training for, and running the Boston Marathon. Both are experienced runners, but will take different journeys as they train for and tackle Boston. This is their first installment of the series as they discuss qualifying, selecting a training program, and overall goals. This is my first time qualifying for the Boston Marathon and I am super excited to be running it in April of 2019. I will be traveling to Boston on my own, but have several friends that will also be running. I spent much of 2017 training to earn a BQ in October at the 2017 Bank of America Chicago Marathon. In short, I worked with two incredible trainers who put together a 12-week program for me which incorporated long runs, speed/tempo training, and strength workouts. With their help I went from a 3:40 marathon finish in April, 2017 to a 3:24 marathon finish at Chicago in 2017. As a female falling into the 35-39 age group, I needed a BQ time of 3:40. However, I knew I needed to shave off at least 5 minutes to have a chance of earning a place at the 2019 Boston Marathon. I believe that focusing on speed work more intensely than I would have liked made an extreme difference in my marathon performance. It also should be noted that the 2017 Chicago Marathon weather was absolutely incredible and more than conducive for running. Like most runners, I came out of the gate way too fast and rocked the first half. 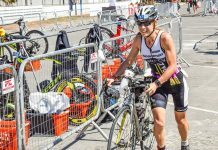 I hit a mental wall from 14-19 as I began to question my ability to keep my speed up. With the help of a few friends along the route, some encouragement from my trainer, and my motivation to finish with a BQ, I was able to get myself out of the bonk, and into enjoyment for the last six; from miles 20-26, I realized that I could do it and would finish with a BQ. I still remember crossing the finish line and my amazement at seeing the clock at the 3:24 mark. Earning a BQ is incredible, but then comes a very long wait, especially when you qualify at such an early race. I had my spot but had to wait a year and a half before I’d be on the Boston streets. Luckily, a first time Boston runner has a lot to learn about the process, which helped to pass the time. I was able to register for the marathon on the second day of registration and received my confirmation within a week. Like most runners, I quickly posted to social media and let all of my family and friends know that I’d be chasing the unicorn in 2019. I then signed up for the Chicago Area Runners Association (CARA) Boston Performance Training to ensure that I would have a space on the CARA bus in Boston. The piece of advice that I received the most was to make sure to have a place to rest that was climate controlled the morning of the race. Tim Bradley, Director of Training at CARA, emailed out a questionnaire to all members of the training group to assess our previous performance and goals. He used that information to put together an incredibly thorough 12-week training plan. I also contacted Nike Coach, Robyn LaLonde, owner of EDGE Athlete Lounge, a USAT Level-1 Coach, Certified Level II Metabolic Efficiency Training Specialist and Head Coach for Nike+ Run Club. Robyn helped me to earn my BQ so it seemed only fitting that I lean on her to help my speed and tempo runs be as effective as they can be. The last bit of preparation I did before the actual training began was to book my flights and hotel. I was pleasantly surprised at the cost of the flight and negatively surprised by the cost of the hotel room. All hotels located within the radius of the race seemed to have an average price tag of $400/night. Sheesh! I’d like to say that my goals for the Boston Marathon are to enjoy it and have fun. That seems like it should be the right thing to say, since this will most likely be a one time experience for me, given the extreme cost and difficulty to get it. But, I know my competitive personality better than that, so I need to set a time goal for myself. Given the difficulty of the course, late start time, and travel factors, I know I need to add some time to my goal, so I am aiming for a 3:35. Follow my training on Instagram and Facebook and be sure to message me any tips you have for a first timer! This will be my second time running the Boston Marathon. I survived the cold, wind and rain that plagued the 2018 race! Finishing it last year (especially with the weather) felt like a huge accomplishment, and I am looking forward to returning again this year. Like Mandi, I used my time from the 2017 Chicago Marathon as my BQ time. The weather during that race was great for running and helped me to PR. I had spent much of the summer training for the race, completing my long runs along the Lakefront Trail. As a male in the 40-44 age group, I needed a time of 3:15 to qualify. My previous marathon PR was 3:09, so I knew this was entirely doable for me. I started the race feeling great and was running a very fast pace for me. However, my stomach started cramping up around mile 14 or 15. I wasn’t able to finish my second GU or take my third one as planned. I think that did slow me down a little the second half, but the energy and excitement of the day helped to carry me through to the end. I still remember seeing my husband cheering me with about 800 m to go. I knew I was going to PR at that point and I got a burst of energy as I ran up Roosevelt before the final stretch to the finish. I ended up crossing the finish line with a time of 2:59:18 – my first sub-3 hour marathon! I was able to register for the marathon on the third day of registration this year and received my confirmation just a few days later. Last year, it was a big deal for me when I got in. This year was a little less so. I imagine this trend will only continue in future years. Last year, I signed up for Fleet Feet’s Boston 365 training program. Although I didn’t exactly follow their training plan last year, the amenities they provided more than made a difference in how I finished the race. Having a private motorcoach to the start line and a warm and dry place to wait until it was time to line up gave me an advantage over the runners who had to stand around freezing in rain and mud last year. Signing up again with them this year was a no brainer for me. I have recently moved from Chicago to Dallas, so I will be loosely following their plan again this year. I am just coming off another year of completing the Dopey Challenge at Walt Disney World, so I know that I am marathon ready and just need to keep up my endurance. Fleet Feet’s amenities in Boston are what I am really after and why I will likely continue to sign up with them in future years; they offer a room block at two hotels just minutes from the finish line at a better rate than most. Last year I stayed in the room block at the Boston Marriott Copley Place and found it to be an ideal location for all the weekend’s events. I am booked there again this year. I’d like to think that the weather in 2019 couldn’t be any worse than 2018, but I don’t want to jinx myself. I am hoping to enjoy the course more this year and to experience what the crowds are like on a beautiful day. Ideally, I’d like to improve on my time from last year (3:11) which should be doable as long as I remain healthy through the next few months of training. I’ve already gotten BQ times for the 2020 Marathon at both Chicago and Disney, so at least that pressure isn’t there for me.